QR-25 is a heavy duty Quincy air compressor offering 1-25 hp, pressure lubricated in all critical areas, runs at slower speeds and features durable cast iron construction for longer life and less downtime. The QR-25 is pressure lubricated in all critical areas, runs at slower speeds and features durable cast iron construction for longer life and less downtime. Because the QR-25 compressed air systems operates at slower speeds, it’s capable of producing more CFM per horsepower. The QR-25 can also deliver up to 500 psig, making it suitable for the most challenging air compression tasks. Intake loaders are designed to reduce horsepower during low-demand applications, which helps to extend valve life. Loadless starting reduces much of the strain on the motor, which also lowers energy consumption — and costs. Positive displacement rotary oil pump provides sufficient lubrication to all vital air compressor components, which ensures smooth operation and further reduces oil temperature. Maintenance on this compressed air systems is a breeze, which contributes to the ease of operation and low cost of ownership. 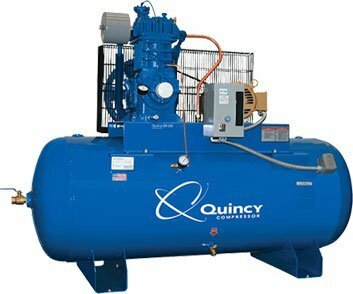 The Quincy QR-25™ 1- 25 hp air compressor is recognized throughout the industry’s leading reciprocating compressor. The QR-25 is pressure lubricated in all critical areas, runs at slower speeds and features durable cast iron construction for longer life and less downtime. The modern-day Quincy air compressor QR-25 traces its roots to the 1930s when it was introduced as a member of what was simply known as “the Quincy Line.” A portable QR-25 version was introduced during the 1950s and was used to provide heated compressed air to keep lenses clear on military equipment. The first four-cylinder QR-25 was unveiled during the 1960s and the Coast Guard began using the QR-25 as part of its tug boat starting procedures in the 1970s.